Discussion in 'UFC Discussion' started by Edmond Rousey, May 18, 2014. But why was it acceptable when he did it? wait, is Stephan looking for a fight? I thought he was retired. little bit different when the middleweight you're talking about is Anderson Silva. Not to mention the numerous times he fought at LHW and the fact that he's a natural LHW. Alexander Shlmenko should be a welterweight. I'd much rather see Rampage fight Stephen Bonnar than King Mo. 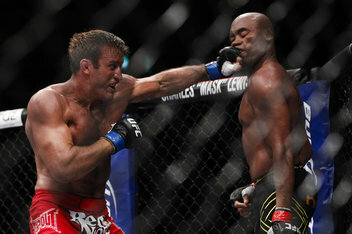 So hopefully Bonnar IS coming out of retirement. Tito via Bonnar failing his drug test. I'm down to see that fight. Not sure who wins but Bonnar has been gone for quite some time. I like Stephen Bonner a lot, but we all know there's an asterisk next to "hall of famer"
Stephan should have got the Rampage fight instead of Anderson. Made sense at the time imo. He beats both Page & Tito. Didn't he fight Terry Martin who is a middleweight/welterweight? How can Bonnar talk bad about Tito when he is infamous for juicing and fighting smaller guys himself and in Terrys case, Stephan Bonnar was his very first mma fight and bonnar coulden't even finish him! Bonnar did say during the Titan FC broadcast on Friday that he missed fighting and would definitely come out of retirement to fight Forrest again... even saying he'd do it for free and Forrest would do it for a hundred bucks. Coming from a guy who is a proven cheat hmmm stfu cheater cheaterson!!!! Because that man has held a title at light heavy weight or could it be that his wikipedia page also lists him as both weight classes? You mean the way Shlemenko is also listed as both a MW and a LHW on his wiki?